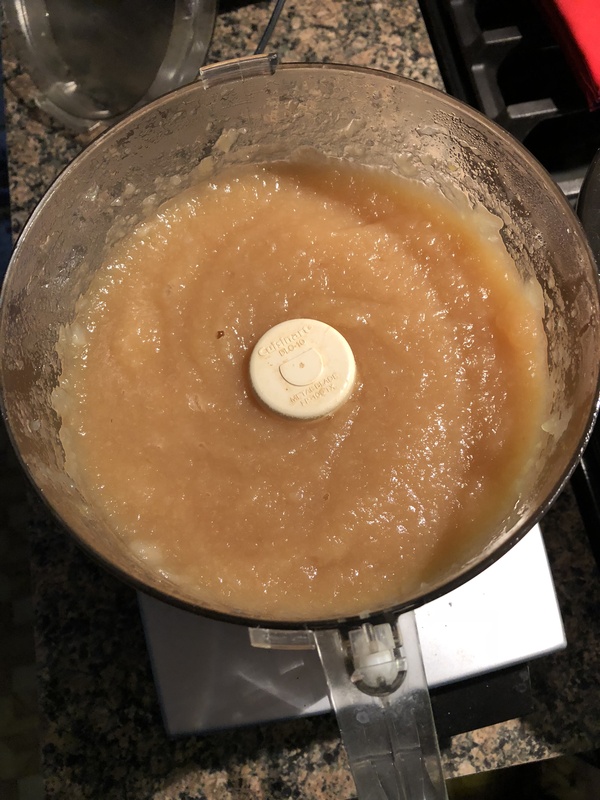 I have an abundance of apples from my recent apple picking outing and while I have been enjoying eating them, I decided to use some of them to make a homemade pear-applesauce. Making homemade applesauce is quicker and easier than you may think. And healthier since you can control the level of sweetness. You could also customize the flavors by adding in different fruits (i.e. peaches, mangoes, cranberries) or different spices. I began by peeling, coring and chopping 2 lbs. each apples (I used red delicious and granny smith) and pears (I used Bartlett). 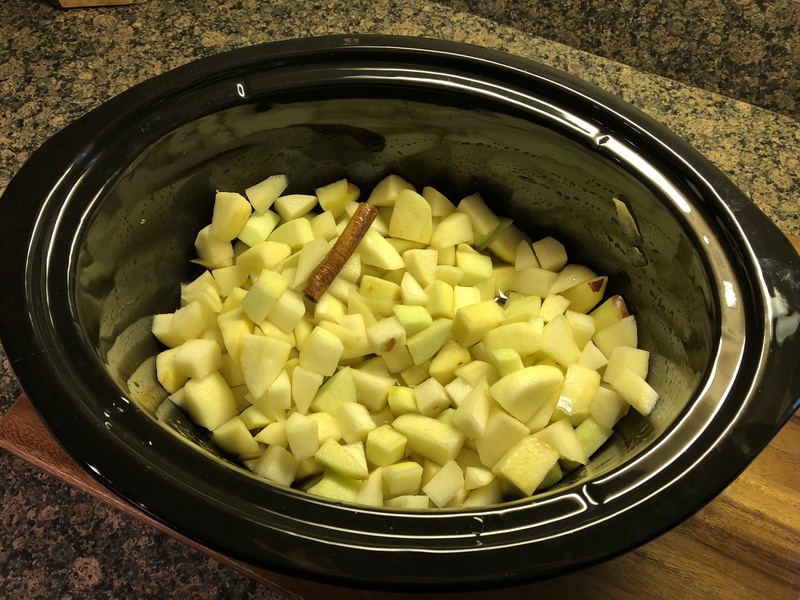 I added the apples along with pure maple syrup, vanilla extract, a cinnamon stick, lemon juice and water to the inset of a slow cooker. I set it took on low for 4 hours and was left with apples and pears that were perfectly tender for the next step. 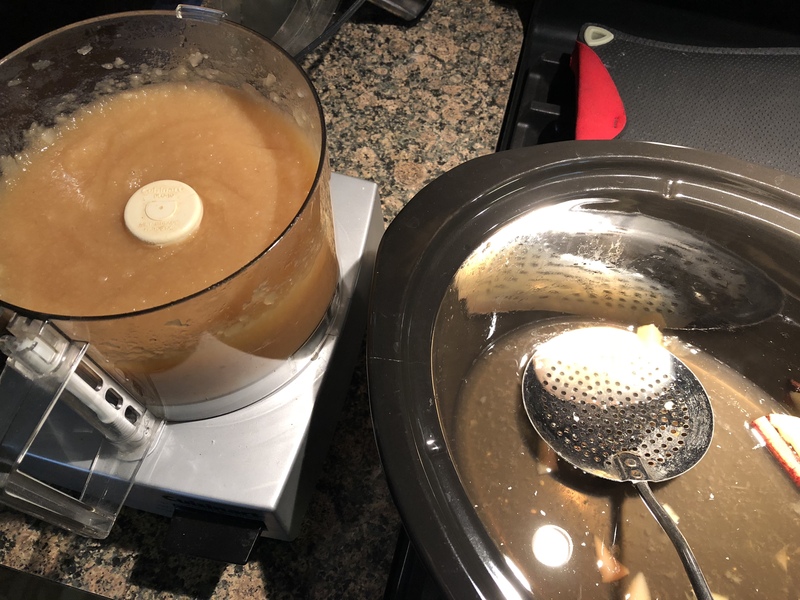 I removed the cinnamon stick and using a slotted spoon transferred the apples and pears to the bowl of a food processor. To prevent the sauce from becoming too watery I didn’t add too much of the juices. I then pulsed the mixture to my desired consistency, making sure no large apple or pear chunks remained. I transferred the pear-applesauce to a container to let it cool and then covered and refrigerated it. Combine all of the ingredients in a slow cooker (at least 6 quarts) and stir to combine. Cover and cook on low until the apples and pears are tender, about 4 hours. Remove the cinnamon stick and transfer the mixture to a food processor or blender and pulse until desired consistency. You could also transfer to a large bowl and mash with a potato masher for a chunkier sauce. Let cool and then transfer to an airtight container and refrigerate. 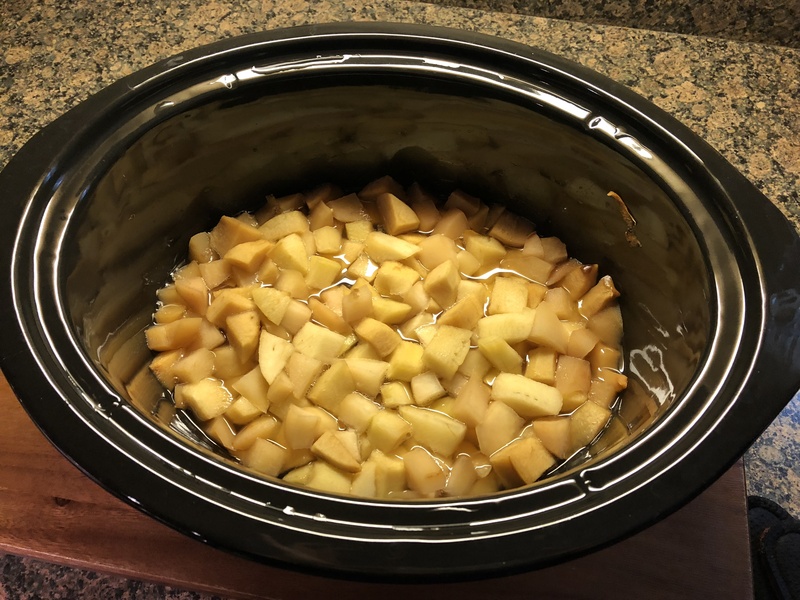 If you would prefer to make this on the stove, increase the water amount to a cup and combine all of the ingredients in large pot and cook over medium heat, stirring occasionally, until the apples are tender, about 25 minutes. For both versions (slow cooker or stove top) you could substitute apple juice for the water.